Dave McKenzie’s Yesterday’s Newspaper, now on view in The Living Years: Art after 1989, is so simple it runs the risk of being overlooked. 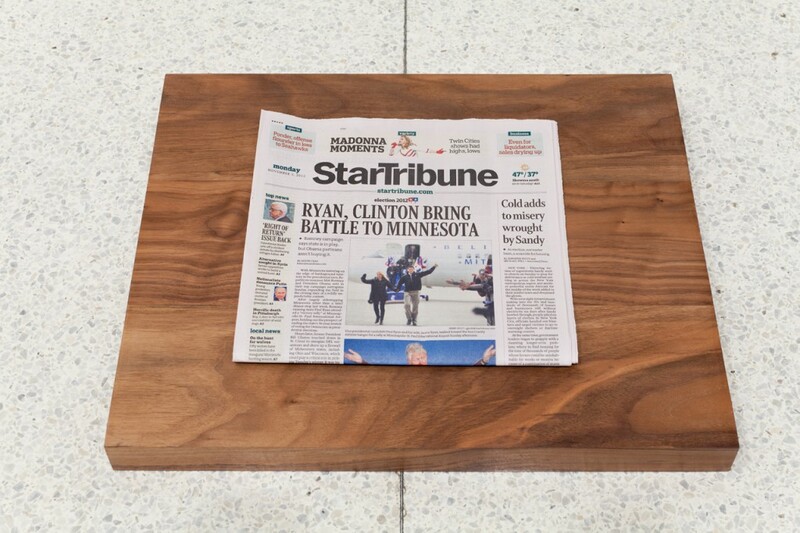 A copy of yesterday’s local paper lays on a walnut slab the way it might sit on your front doorstep. But the humble work captures a monumental gap: between news that’s happened and news that hasn’t, what we know and what we don’t, yet. For the next two days, we’ll present images of this ever-changing work. Here’s how the piece—featuring the November 5 issue of the Minneapolis Star Tribune–looks today, the day before we find out the results of another historic election. Hear McKenzie discuss his work at the Walker on November 8, 2012.